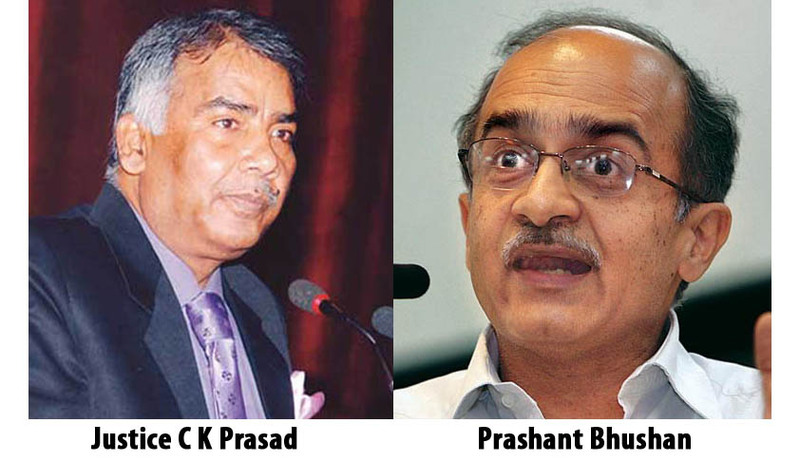 The activist lawyer Prashant Bhushan, in his capacity as the Convener of ‘the Campaign for Judicial Accountability and Reforms’, has written a letter to Prime Minister Narendra Modi, requesting the cancellation of appointment of Justice C.K. Prasad as the Chairperson of the Press Council of India. A copy of the letter is with Live Law. The letter by Bhushan refers to a letter written in February by Senior Advocate Dushyant Dave, to the then Chief Justice of India, P. Sathasivam, which states that Justice C.K. Prasad while hearing a Special Leave Appeal (crl) no. 7232/20113, ordered to list civil appeal no. 9454-3455/2013 (though he intended that civil appeal no. was 9454-9455/2010 be listed) as the matter were of similar nature on his own and without any of the counsels asking for the same.On the next hearing when matter came up on board, civil petitions were not listed because of wrong civil appeal no being mentioned in the previous order. The court again ordered to tie up the matter as urgent. When both of the matters when came up for hearing on 25th February 2014, at the outset itself, Justice C.K. Prasad who was heading the Bench, accepted the submission of Senior Advocate C.U Singh, that both the matters were not connected to each other. Despite, there being no connection, civil appeal no 9454-9455/2010 was taken up and in the absence of any effective representation from City and Industrial Development Corporation of Maharashtra(CIDCO), the civil appeal was allowed without any debate. This was despite the fact that settlement was rejected earlier by a different Bench of the Supreme Court through an order dated 25.04.2013. This had led to Mistry Construction obtaining the respective tender and 35 hectares of prime land worth hundreds of crores which was rejected by the Bombay High Court. Live Law has learned that a Senior Advocate, who is known for his integrity, has even given a Certificate for filing curative petition, but CIDCO has not taken any steps towards the same.